Citation Information: JCI Insight. 2018;3(9):e98694. https://doi.org/10.1172/jci.insight.98694. Measurements of intracellular cGMP concentration in living cardiac sympathetic neurons in the presence of BNP. 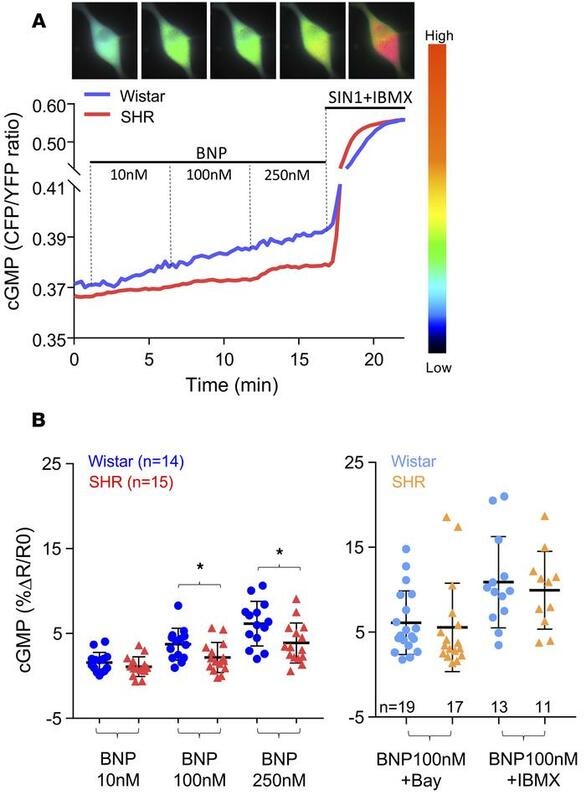 (A) Representative data traces showing dynamics of cytosolic cGMP-induced fluorescence resonance energy transfer (FRET) changes by ratiometric recording of CFP and YFP emission changes in response to increasing concentrations of brain natriuretic peptide (BNP) in spontaneously hypertensive rat (SHR) and Wistar cardiac sympathetic neurons. Saturation of the sensor was achieved using 3-morpholinosydnonimine chloride (SIN-1 chloride; 10 μmol/l; Calbiochem, 16142-27-1) + IBMX (100 μmol/l). (B) Percentage changes in cGMP in response to increasing concentrations of BNP (left, from 10–250 nmol/l) and 100 nmol/l BNP with 1 μmol/l Bay 60-7550 or 100 μmol/l IBMX (right) in SHRs and Wistar rats. *P < 0.05 by unpaired t test. In each case, neurons were derived from 3 or more rats. n indicates number of SG neurons.